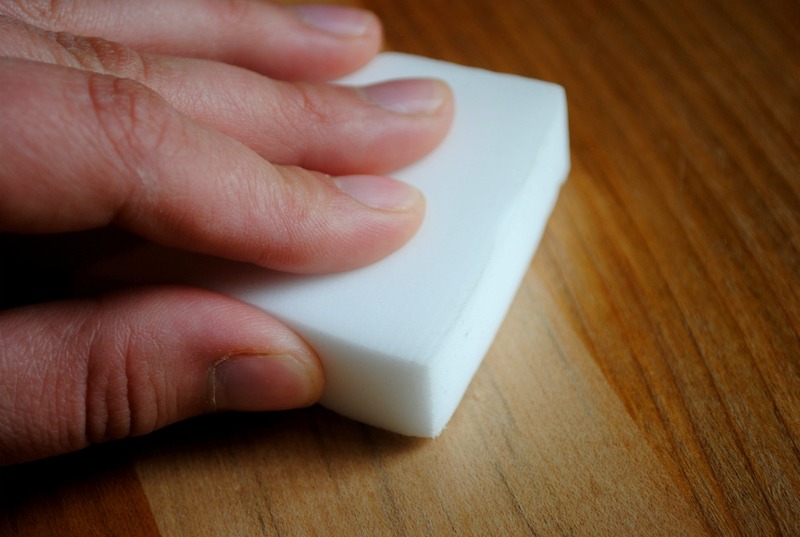 Melamine Foam Sponge Facts: Is Melamine Toxic? What Is Melamine Sponge Made Of? How Does A Melamine Sponge Work? I’ve shared my experiences using many different types of sponges over the past several years. Of all the different sponges I’ve used, the melamine foam sponge is the one that I use most often in our house with 3 dogs. How does a melamine sponge work? What is melamine sponge made of? So I thought I’d share some important facts about melamine sponges, to calm some fears and help you feel more comfortable about using melamine sponge around the house… around your kids… and around your pets. #1 – Are melamine sponges safe to use on skin? Melamine is safe to hold, handle, and scrub things with — just don’t rub your skin, the paint of a car, or any delicate/glossy surface with a melamine foam sponge. Specifically, some of our readers have asked about using a melamine sponge or Magic Eraser to remove makeup, a Koolaid mustache, permanent marker, hair dye, and other substances from the skin. You wouldn’t use a fine sandpaper on your skin — so don’t use a melamine foam sponge that acts like a fine sandpaper on your skin either! It’s just common sense not to use something that feels like sandpaper on delicate skin. #2 – Is formaldehyde in melamine sponges? Wondering about the use of formaldehyde in melamine sponges and Magic Erasers? By the way… generic melamine sponges and the original Mr. Clean Magic Erasers are made of the exact same ingredients. And yes, a generic melamine foam sponge works just as well as a Mr. Clean Magic Eraser melamine foam sponge does! #3 – Is melamine toxic? What if a child or a pet swallows part of a melamine sponge? Any item that fits inside a child’s mouth (or a pet’s mouth) can become a choking hazard if swallowed. Any foreign substance inside the stomach can cause stomach upset. Again, it’s common sense. Do not allow your children or your pets to play with melamine sponges… or any of your cleaning supplies! If they put such items in their mouth, they could choke and/or get an upset stomach. #4 – How does a melamine sponge work? Since there are no cleaning chemicals used with melamine sponges (you simply dampen the sponge with water before using it each time), the melamine foam itself is doing all the work. Melamine foam acts like a porous, super-fine sandpaper — with lots of tiny little holes all throughout. Since melamine is an open-cell foam, it is incredibly flexible and can get into small spaces, cracks, and crevices much more easily than a traditional sponge can.